-New multi-channel layering technology, incorporating a custom library of specially recorded samples taken from every fret of all 6 strings of a real guitar. -The unique Floating Fret Position technology, which imitates change of fret position of a guitarist's hand on the neck. 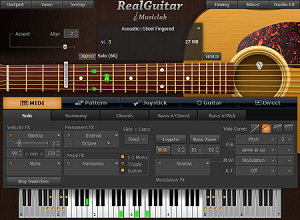 This gives you the possibility of playing on up to 104 guitar frets using just 43 keys of a standard keyboard! -Our original Guitar Touch technology letting you easily imitate basic guitar techniques (strumming, plucking, sliding, bending, muting, etc..), using standard MIDI keyboard and MIDI controllers, such as Pitch Bender, Modulation Wheel, Sustain Pedal, Aftertouch. -Guitar Rhythm Pattern technology providing powerful Pattern Manager completed with huge MusicLab Guitar Pattern Library for easily creating guitar accompaniment tracks. -All you have to do is to find the appropriate rhythm pattern(s) in the Pattern Manager tree view, copy it to the needed number of measures, start your sequencer and use MIDI keyboard to play chord changes, or alternatively add chords to a MIDI track via sequencer's editor. -The unique Struminator technology letting you use alternative MIDI controller (standard Guitar Hero game controller for Sony Playstation 3 by Activision Inc) for creating authentic guitar accompaniment parts with ease and fun.